The only legitimate object which states should endeavor to accomplish during war is to weaken the military forces of the enemy. The Second World War was far more brutal to noncombatants than the First, including the use of fire bombing and two nuclear detonations against cities, after which it was discovered that radiation posed a severe threat to the survivors. Under the nuclear shadow, combat evolved from large-scale conventional campaigns in Korea, Vietnam, Afghanistan, and Iraq to low-intensity, unconventional and limited conventional wars. These wars have placed a heavy toll on noncombatants, who are taking a horrific beating in Syria, Afghanistan, Sudan, eastern Ukraine, Gaza, and wherever ISIL rears its hydra-heads. In the last decade alone, cluster bombs have reportedly been used against civilians by Syria, Israel, Hezbollah, Sudan, Russia, Ukraine, Libya, Saudi Arabia, and Thailand. All violence directed against noncombatants is local, but the demise of borders and governance has growing international ramifications. Displaced humanity and refugee flows have doubled in the last two decades. Paradoxically, concerns over the humanitarian consequences of using nuclear weapons have grown alongside the carnage of unconventional and limited conventional warfare. There are several reasons for this paradox. 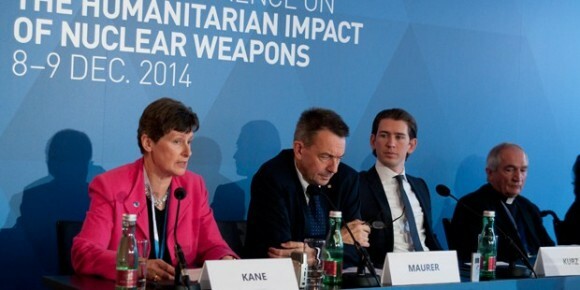 Nuclear disarmament campaigns fill vacuums and counter strategic modernization programs. The snail-like pace of U.S. and Russian strategic arms reductions, the absence of negotiations on deeper cuts, and growing Chinese, Pakistani, Indian, and North Korean stockpiles warrant rejoinders. Enter the Humanitarian Pledge movement, which seeks to “stigmatize, prohibit and eliminate nuclear weapons in light of their unacceptable humanitarian consequences and associated risks.” In addition, this initiative calls on states possessing nuclear weapons to take “concrete interim measures to reduce the risk of nuclear weapons detonations.” Over 100 nations have endorsed this agenda. Pope Francis and other religious leaders have given it a powerful moral impulse. The U.S. has come to the conclusion that, to the extent feasible, basic military strategy in a possible general nuclear war should be approached in much the same way that more conventional military operations have been regarded in the past. That is to say, principal military objectives in the event of an atomic war … should be the destruction of the enemy’s military forces, not of his civilian population. In other words, we are giving a possible opponent the strongest imaginable incentive to refrain from striking our own cities. The Kremlin never picked up the phone and, besides, McNamara’s formulation couldn’t withstand the orthodoxy of U.S. nuclear targeting, which included command centers, war-supporting industry and other targets that were located within or nearby cities. Yields can be downsized and limited, very small target sets can be planned, and a demonstration shot can signal strong interest in halting an adversary’s advance and limiting damage. But all of these limited options can open the Gates of Hell unless escalation can be controlled. A threat or use of force by means of nuclear weapons that is contrary to Article 2, paragraph 4 of the UN Charter and that fails to meet all the requirements of Article 51, is unlawful. The threat or use of nuclear weapons would generally be contrary to the rules of international law applicable in armed conflict, and in particular the principles and rules of humanitarian law. However, in view of the current state of international law, and of the elements of fact at its disposal, the Court cannot conclude definitively whether the threat or use of nuclear weapons would be lawful or unlawful in an extreme circumstance of self-defense, in which the very survival of a State would be at stake. This finding barely leaves room for limited use in extreme cases but, even here, this opening closes without assurance of escalation control. Lower-yield weapons and limited-use options pursued to avoid greater humanitarian consequences lose their purpose in the absence of escalation control. As long as nuclear deterrence is predicated on war-fighting strategies, there are no good answers to the questions raised by the humanitarian-consequence movement — whatever the size of the arsenal. Small arsenals that seek to deter by killing cities are contrary to the humanitarian laws of war. Nuclear arsenals that are climbing into three digits fail worse, and arsenals that stretch into four digits fail the worst of all. The only way that arsenals in being can be squared with humanitarian laws of war is if they are never used pending their elimination. Avoiding the next use of a nuclear weapon obligates states that possess these weapons to engage diplomatically to reduce risk and stockpiles. There are no current, substantive, bilateral engagement between states that target each other with nuclear weapons. States that don’t talk to each other cannot be expected to excel at nuclear escalation control. Note to readers: Stimson and the Carnegie Endowment are co-hosting a discussion of the Humanitarian Pledge and nuclear deterrence at Stimson on October 19th at 12;30 pm. Our speakers are James M. Acton, Co-Director of the Carnegie Endowment’s Nuclear Policy Program; Father Drew Christiansen, Distinguished Professor of Ethics and Global Development, Georgetown University; Elbridge Colby, Robert M. Gates Senior Fellow, Center for a New American Security; and Thomas Moore, Independent Consultant. Click here to RSVP for the event if you will be in the D.C. area. Wait – Hezbollah used cluster bombs against civvies? When did that happen? Not denying, just curious. If shots were exchanged between China and the US, and there was a declaration of war, could China legally nuke a carrier group? Again, NO intention to imply that’d ever happen in a million years, just curious about the legalities. Keep in mind that the word ‘illegal’ is just shorthand for ‘will predictably be subject to an enforced sanction by a court if enacted’. The act of nuking a US carrier would therefore be illegal if and only if the US prevailed in the conflict, and then subjected the Chinese decision-makers to some sort of trial. If the war was a stalemate or resulted in a Chinese victory, there would be no trial, so no punishment, and so the act would be legal by definition. The above formulation will be rejected by legal positivists, of course. However, I find the entire worldview of legal positivists so incomprehensible that I will refrain from speculating as to how they’d respond. For years now, I have subjectively estimated the chances for war between U.S. and China over Taiwan are in the neighborhood of 50% over 50 years. If that were to occur, there is maybe a 30% chance of limited nuclear war and 10% chance of all-out nuclear war. The chance of China nuking an aircraft carrier is perhaps low (<15%), but by no means an extreme hypothetical. Even if nuclear war is avoided, many in DoD are worried that a Chinese conventional missile might sink that carrier. It's going too far to say an act (e.g., bank robbery) is legal – so long as you don't get caught and punished. On the other hand, I do see the need for a sheriff to arrest you, a court to try you, and a jail or firing squad to punish you, with some significant degree of probability. The U.N. Security Council, with the 5-way veto power for the U.S., U.K., France, Russia, and China is not a plausible sheriff for enforcing an anti-nuke "law" against any of the P-5. Even if the U.S. won the war over Taiwan, I don't see any practical reason for supposing the U.S. would invade China for the sole purpose of arresting its leaders for nuking an aircraft carrier. In the event of nuclear war, of course, the U.S. and China might nuke aircraft carriers and other military targets. If that is not "legal" then what are nuclear weapons useful for? Expensive scarecrows? If China bombed U.S. cities, a U.S. President would likely bomb Chinese cities, rather than try to hunt down and arrest Chinese leaders and put them on trial. At this stage in history, it is not illegal to nuclear bomb cities either, however unwise or disastrous that might be. I’m no statistician, but these percentages leave me cold. I remember when Senator Lugar was on the SFRC, he used to send out questionnaires to us experts on the probabilities of something really bad happening. Our prognostications were always pessimistic. Ten years later, they were badly wrong. 83 experts were surveyed for their opinions on likelihood of significant WMD terrorist attack over a 10 year period (maybe 2005-2014). The average opinion was 29% for nuclear attack, 33% for biological attack, 30% for chemical attack, and 40% for a radiological attack. There was a wide range of opinion, with some experts giving higher odds, and some lower odds. In the event, none of these events transpired during the 10-year period. If experts were re-surveyed today, they would likely assess lower odds. I did try to analyze this data and asked the Lugar Center for a copy of the original data (minus the names), but was rebuffed. The Lugar report suggested combined odds of any WMD attack of as much as 70%, but this lacks evidentiary support as no survey question addressed the combined odds. My best guess is that some experts saw high odds for WMD use of all types, while other experts saw lower odds for all types. These odds would likely be highly correlated with the unasked question, how likely is it that al qaeda will become the biggest, baddest terror group in all history? The average of expert opinion was not “proved wrong” because the flip side is 71% chance of no nuclear attack, 67% chance of no biological attack, 70% chance of no chemical attack, and 60% chance of no radiological attack. Nevertheless, the evidence of history is that “conventional” terrorism is far more likely than WMD terrorism, WMD terror attacks are rare, and chemical weapons are the most likely type of WMD attack. None of this means the odds of other WMD attacks are zero, but realistic numbers are probably lower than what the experts assessed in 2004/2005. There were israeli allegations that hezbollah had used cluster munition warheads on their artillery rockets in the 2006 war tho` hezbollah denied this. HRW claims that it was indeed the case. Ah, I see. Thanks to you and Flames for the references. Idiotic shots from Hamas with their ridiculous bottle rockets down the other end couldn’t hit the planet of earth if it wasn’t for gravity, but Hezbollah are far more serious. ‘Specially if they’re getting them (however indirectly) from Russia (which, I guess, you’d have to assume). India is working towards creating three new tri-Service organisations to handle the rapidly-expanding challenges in the crucial domains of space, cyberspace and clandestine warfare, which will be headed by two-star generals, in a synergised manner. PATRICK AIR FORCE BASE, Fla. (AFNS) — The Air Force Technical Applications Center here recently activated five newly-designated squadrons, as the center takes steps to reorganize after becoming a wing equivalent in August 2014. The ceremonies were historic events for the center, as well as for the Air Force, officials said. AFTAC was first organized in 1959 as the 1035th U.S. Air Force Field Activities Group. For the next several years, five technical operations squadrons carried out specific portions of the nuclear treaty monitoring mission. The panel discussion yesterday on “Morality of Nuclear Deterrence” lead off with Father Christiansen, who noted that Pope Francis favored “the poor, the planet, and peace.” By some reasoning, unclear to me, he concludes that nuclear deterrence is immoral and that nuclear disarmament should be an urgent goal. The other three panelists disagreed with this conclusion. The main point of contention seems to be whether any nuclear use, even a very limited use, is inherently uncontrollable and would escalate to catastrophe. Although none of the three believed uncontrolled escalation was inevitable, some believed escalation significantly more likely than others. The most cautious of the three would set a high threshold for nuclear use, namely that the existence of the state(s) must be under threat. Since neither full control nor complete loss of control is inevitable, the matter must be viewed in probabilistic terms. The likelihood of both controlled, limited use and uncontrolled escalation is related to the size of the stakes. For example, a conflict over tiny islands might have a 5% chance of limited nuclear use and 20% chance of uncontrolled escalation, for an overall 1% chance of full scale nuclear war. A conflict over a major territory might have a 75% chance of limited nuclear use and 2/3 chance of uncontrolled escalation, for an overall 50% chance of full scale nuclear war. In neither of these two examples is it rational to initiate even a limited nuclear use. If it is not rational, it cannot be moral, because the expected vast harm outweighs any good that might be achieved. This is true even for the supposedly high threshold for use, only when “the existence of the state” is at stake. If by “state” one means government, the stakes are clearly too low to justify nuclear war. Nuclear war threatens the very existence of the people. It is better to allow a government to be overrun and disappear than to endanger tens or hundreds of millions of people. None on the panel mentioned nuclear winter. If nuclear winter be true, the death toll could be in the billions. Is there any way to enforce such a pledge and any sub clauses? I am not concerned about non-state groups, but merely among existing states with nuclear weapons capabilities. I ask because it looks challenging to get a nation which possess maybe one reliable nuclear weapon to accept that it should restrict the use of that weapon only to enemy military targets. It is much more efficient for such a state to refrain from making any such pledge and leave the door open to the possibility of pursuing mixed targets. If one puts enough pressure on states with smaller numbers of nuclear weapons one could theoretically get them to initial such a pledge, but I feel it is unlikely to be a meaningful commitment. An example of this is Pakistan – it doesn’t make sense of Pakistan to commit its weapons to a use against Indian military targets only when a simple conventional strike by India could destroy the Mangla and Tarbela dam complexes. Pakistan gains a measure of deterrence by leaving the option of pursuing a mixed target like Gobind Sagar complex. It would be difficult to convince the Pakistanis to give that option up.